Strong unions can help improve working conditions within occupations and industries, going far beyond simply improving wages. Unions can help employers provide training, reduce turnover, and generally improve the work environment in ways that benefit employers and workers by helping ensure that competitive pressures do not bring out the worst tendencies in employers. Indeed, unions can help set and protect basic employment standards for entire industries. 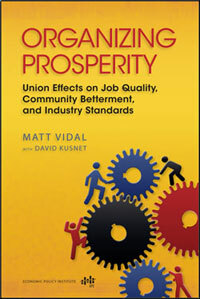 The benefits that arise from labor-management agreements—and the costs for workers and communities of undermining longstanding, successful agreements—are the stories of Organizing Prosperity, an examination of the role that unionism has played in lifting up workers, communities, and even businesses themselves in a dozen American occupations and industries.